What I loved about to be all ways to be was its tranquility, earthiness and refined presentation. 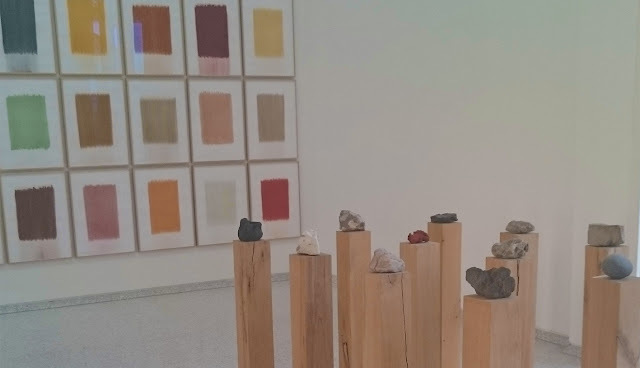 With lots of natural light beating in, falling upon plinths, sculptural forms and pressed objects, it formed an elegant natural archive which was a joy to unpick, allowing visitors to explore philosophical themes in a reflective way. #9 Central Pavilion (Giardini). Coronation Park, Raqs Media Collective. I've heard critics talking smack about this work, but for me this twisted collection of sculptures worked really well in the gardens of the Giardini, subverting regal imagery alongside quotes from George Orwell’s 1936 essay Shooting an Elephant. They made you look twice by cleanly defacing classical statues which you could almost take for granted in their setting, acting as strong way-markers for themes explored later in All The World's Futures. #8 Canadian Pavilion. Canadassimo, BGL art collective. Canada gets top marks for both bafflement and amount of stuff per sqm. After casting an eye around a shop full of holographic goods, we went to leave - at which point the shop keeper piped up telling us there was 'more in the back'. Passing through hanging plastic strips behind him into a workshop bursting with paint cans, we continued up to the roof where an elaborate machine was creating a pattern using coins. It was all a bit much, in a good way. #7 Romania Pavilion. Darwin's Room, Adrian Ghenie. Amongst the absurdity of many of the country's pavilions (some filled entirely with water; another with remote control trees) it was great to see some really interesting work on canvas in Romania's offering, Darwin's Room. 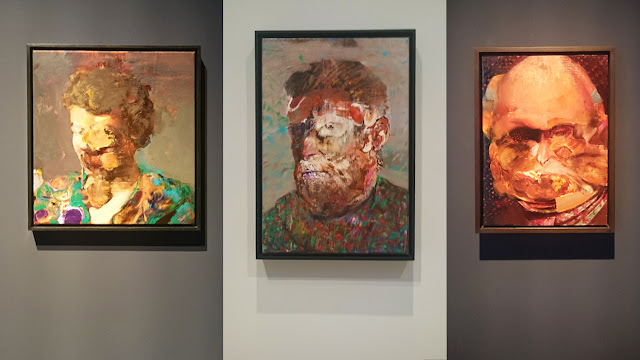 These richly textured paintings were easy to get lost in, particularly the smaller visceral portrait pieces. #6 Venezuela Pavilion. Te doy mi palabra (I give you my word), Argelia Bravo and Félix Molina (Flix). As shown in my blog post of Venice snapshots, Venezuela's pavilion was my kinda place; vibrant and painted with colourful shapes with warm-hearted words on the outside. There was a great balance of interior and exterior artwork; projections within showing powerful videos of balaclava-ed women breastfeeding. Badass, and natural. #5 Japan Pavilion. 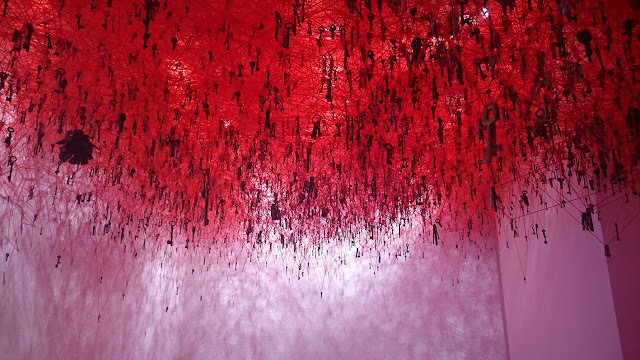 The Key in the Hand, Chiharu Shiota. Unsurprisingly the beautiful Japanese work The Key In The Hand was exquisite to witness, culminating in a wonderfully intricate installation of countless keys exploring the idea of memories and how we access them. The accompanying video piece was a real gem too though, asking kids to describe how they had come into the world. #4 Nordic Pavilion. Rapture, Camille Norment. 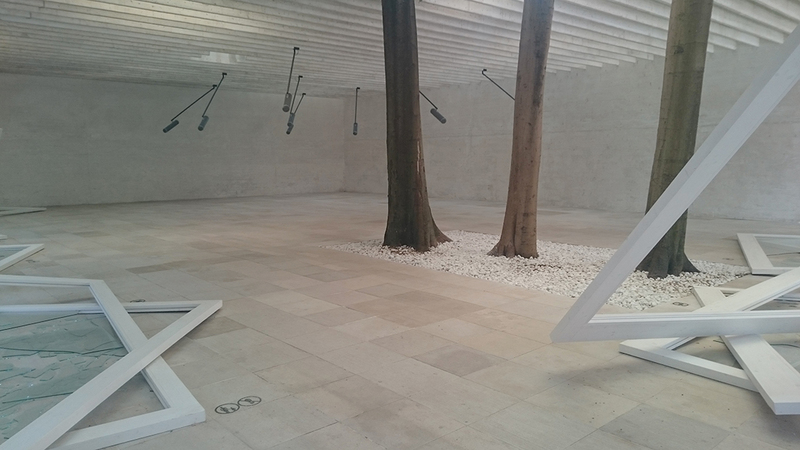 This year the Nordic pavilion was headed by Norway, showcasing a landscape of sound in a light contemporary space with trees growing through the roof. Elements were poised as if something had just happened, with the outer panels smashed leaving carefully arranged shards. A simplified wonderland of baited breath and stillness. #3 V-A-C Foundation (Casa dei Tre Oci). 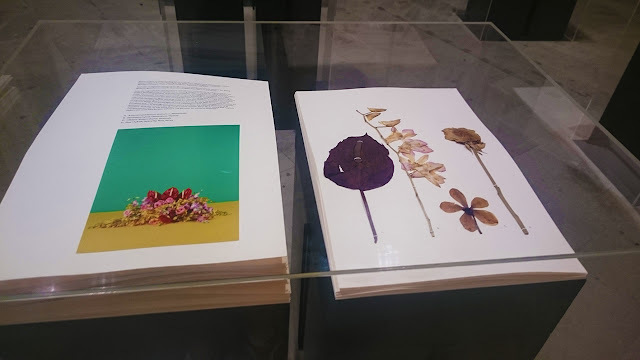 Future Histories, Mark Dion and Arseny Zhilyaev. Travelling over to the island of Zitelle by boat was the perfect introduction to this joint show by Dion and Zhilyaev, focusing on wunderkammer in the making and an imaginary future museum. 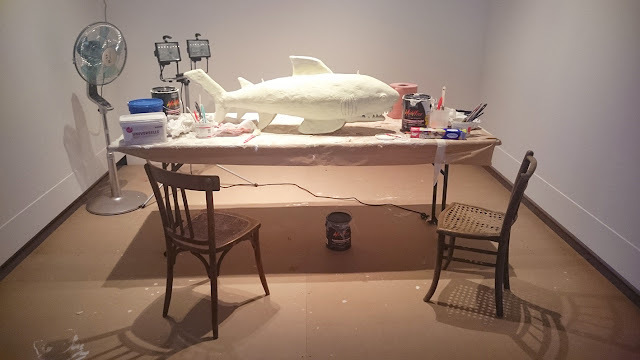 A heady blend of oceanography and Russian Cosmism, what I loved about this exhibition was the feeling of playfulness and process, including abandoned workstations paused at different stages of production now left for us as museum-goers to oogle hungrily. #2 Corderie (Arsenale). All The World's Futures. 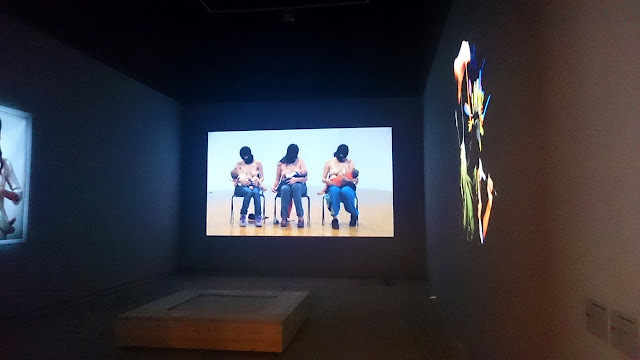 My Epidemic (Small Bad Blood Opera), Lili Reynaud Dewar | Paperwork, and the Will of Capital, Taryn Simon. #1 EM15. Doug Fishbone's Leisure Land Golf. Last off, the best experience of the Biennale was playing mini golf in the scorching heat on a Castello dock. Acting as the East Midlands pavilion, each hole of Doug Fishbone's course had been designed by a different artist, using the golfing format as a means for interaction with and comment on various topics such as immigration, police shootings, capitalist exploitation and various disasters. All that, and tiny pencils. We have a winner.